You have been using drugs, alcohol or both now in excess for a long time and have made the conscious and firm decision to stop. What then? Can you just stop? Can you really die by quitting cold turkey? The answer is a resounding YES. It is a terrible idea and you should not do it. In the addiction world, there is no greater danger to an individual than detoxing from alcohol. It is by far the most dangerous substance to quit. It may not seem like it might happen to you, but it easily could. Cyndie Dunkerson, clinical supervisor for Hope by the Sea in San Juan Capistrano says, “While you’re withdrawing from other drugs, you may want to die, but alcohol detox is the only actual drug detox you can die from.” If you are considering quitting alcohol, do it within the safety of a drug detox center. In a 2015 study in the journal JAMA Psychiatry, 32 million people had a severe alcohol problem last year. Approximately 5% of people that attempt to detox on their own have seizures. Even if only a million of those people try to quit on their own each year, that’s 50,000 people having seizures. That’s a lot of people. And some of those people will die. During alcohol withdrawal, the brain undergoes significant physical and neurological changes. A hangover, for example, is a mild form of withdrawal. The most serious form of alcohol withdrawal is called delirium tremens, commonly known as DT’s. The most common symptom associated with DT’s are uncontrollable shaking but can run the gamut of different things, including hallucinations. Drugs and alcohol change the brain significantly over time and removing alcohol suddenly require quick adaptation that it can sometimes not handle. After learning how to operate with alcohol, its deprivation can cause short circuits in the brain, and the nerves, now over active and irritated can cause grand mal seizures. It’s best to alcohol and drug detox in a drug detox center with experts so that you can be monitored carefully. These seizures don’t always happen right away, usually occurring 3-4 days after the last drink and sometimes 7-10 days after. It is important you are in the care of a professional during this time. The most famous example of this in recent memory is Amy Winehouse, who died while trying to detox on her own. Her father, Mitch Winehouse says he believes she tried to quit cold turkey and had a seizure with no one around. There are all kinds of products on the market that seem to promise a “cleanse” and a “quick detox”. This could give some people the impression that they could use that to detox. This couldn’t be further from the truth. There is no such thing as a quick natural drug detox or miracle recovery drink. Alcohol detox is serious business and should be treated as such by doing it the right way, as an inpatient at a drug detox center. Even though there is virtually no clinical risk of dying from drug detox alone, it is still important that you be in the care of a professional at a drug detox center. 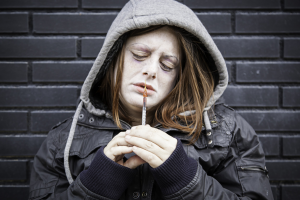 Drug detox, say from heroin, for example, brings insane pain, writhing, and discomfort. It is a process so bad that most people going through withdrawal wish for death. And some fulfill that wish by committing suicide. Remember that even though information in the internet age is placed easily at our fingertips, it does not mean you are a doctor just because you can look up some medical information. It’s best to do it the right way and get help and support, first from the professionals for the physical symptoms, and ongoing from your family and friends. Don’t do either alone!